The idea of dwarf dinosaurs on Haţeg Island, Romania, was proposed 100 years ago by the colourful Baron Franz Nopcsa, whose family owned estates in the area. He realized that many of the Haţeg dinosaurs had close relatives in older rocks in England, Germany, and North America, but the Romanian specimens were half the size. In new work by Professor Mike Benton at the University of Bristol, and six other authors from Romania, Germany, and the United States, Nopcsa’s hypothesis is tested for the first time. 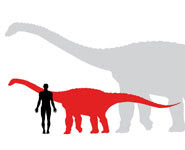 They found that the Haţeg Island dinosaurs were indeed dwarfs. One much debated theme among evolutionary ecologists is whether there is an ‘island rule’, the observation that large animals isolated on islands tend to become smaller. There is no doubt that the Haţeg dinosaurs were small, but were they just juveniles? Three species of the Haţeg dinosaurs – the plant-eating sauropod Magyarosaurus and the plant-eating ornithopods Telmatosaurus and Zalmoxes – are half the length of their nearest relatives elsewhere. The team examined these three dinosaurs, each represented by many specimens, but they found no evidence of any large bones such as they would expect to find in their normal-sized relatives. More importantly, a close study of the bones confirmed that the dinosaurs had reached adulthood. As dinosaurs matured, just like humans, their bones lost their growing centres and fused. In addition, detailed studies by Martin Sander in Bonn and his students, show that the bone histology (the microscopic structure) is adult. Traces of earlier growth can be tracked in the core of the bone, and the outer surfaces are solid and show evidence of ‘remodeling’ only seen in adults. Professor Benton said: "The idea of ‘island dwarfing’ is well established for more recent cases. For example, there were dwarf elephants on many of the Mediterranean islands during the past tens of thousands of years. These well-studied examples suggest dwarfing can happen quite quickly. The general idea is that larger animals that find themselves isolated on an island either become extinct because there isn’t enough space for a reasonably-sized population to survive, or they adapt. One way to adapt is to become smaller, generation by generation." The Haţeg dinosaurs date from close to the end of the Cretaceous Period, some 65-70 million years ago, when much of Europe was flooded by great seas. There was an archipelago of islands across eastern Europe and the Mediterranean coastal area and dinosaurs are known from some of these islands. Haţeg Island was about 80,000 km2 in area and the rich assemblages of fossil plants, insects, fishes, frogs, lizards, birds, and mammals show that the scene was rich and tropical. How did the dinosaurs get to the island? It’s not certain whether they were marooned there as the seas rose, or whether they swam or drifted there by chance later on. Either way, this research demonstrates that once they arrived they evolved to become dwarfs.